Full surveillance systems are becoming a lot more popular provided how low-cost they can be. As soon as reserved just for businesses or huge estates, now the majority of people could tap into the power of a good bundle system. There are many Usages for full surveillance systems including those for restaurants, retail shops, child care facilities, storage facilities, private detectives, animal kennels, watercrafts, your home, villa, construction sites and also offices. Practically any sort of establishment, structure or house that you need to keep watch on, needs a complete monitoring system. Having safety and security cameras in plain website help in reducing crime as well as burglary. These systems additionally provides a deterrent to quit employee theft or little petty crimes. Complete Surveillance Equipment supply security remedies for industries such as banks, gas terminals, buying centers, airport terminals, institution areas, army bases, medical facilities and gambling establishments. Whether you have a house or a company, you're recommended to take every possible safety measure to maintain your points safe. This entails recording security footage of every location of your house or business need to a burglar occur to break in. The very best method to safeguard your residence is to buy a good home surveillance system. Make certain that prior to you vanish for the holidays that your home protection cameras are all functioning correctly to ensure that you are getting the most security. A properly set up monitoring system can check the border of your property and primarily notably the electronic cameras can keep an eye on the essential access factors of your house to avoid theft. We additionally suggest placing a couple of cameras to enjoy home windows and doorways that may be blocked by trees or big bushes. 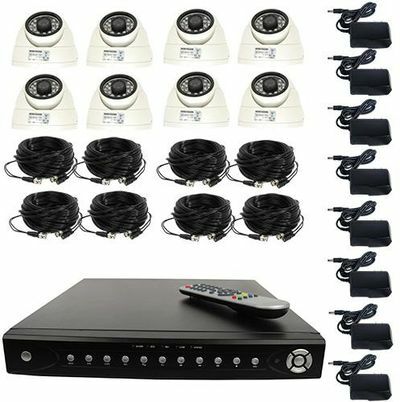 Our IntelliSpy high definition 8 channel surveillance system comes complete with 8 HD Dome cameras, 8 Channel HD DVR with 2 or 4 terra byte hard drive installed, 8 HD plug and play 100 foot cables and 8 power adaptors. The complete system makes install a piece of cake. With this HD camera system you get no trailing when an object is moving in the field of view. You can make out license plate numbers and allow you to actually see the face of an intruder all while using the supplied plug and play HD cables. You can store about 5 days of constant recoding with the 2TB hard drive. You can store about 10 days of constant recoding with the 4TB hard drive. You can increase the record time by using motion detection where the DVR will only record when there is motion in the camera field of view. This HD DVR can be connected to the internet which will allow you to view the cameras remotely via smart phone, computer, or any mobile device from anywhere in the world. We recommend connecting this HD DVR to an HD TV or HD monitor using an HDMI cable(not included) for best results.